Homelessness has been one of the biggest talking points of 2018 so far, and for good reason. Hundreds of thousands of people across the UK are forced to live on the streets, sofa surf, or are stuck in dangerous rentals and unable to speak out. And more than a million people have to deal with a rogue landlord who breaks the law. For most people, homelessness is difficult to imagine. But it isn’t as far away as we’d like to think: in fact, given how prevalent it is, you probably know someone who is, or has been, temporarily homeless. It’s also an issue that touches on the very core of our human rights: after all, a stable home has a huge impact on our entire lives. From our education and health, to our dignity and right to a family and private life, we need to be doing more to make sure these rights are real for everyone. Homelessness isn’t just a number, but it is a big number, with 300,000 people in the UK affected according to statistics from November 2017. That’s roughly 1 in every 200. Let’s put that figure in a familiar context. How big was your school? In secondary school, the average class size is slightly more than 20. Times that by 14 (we’re assuming two classes per year group, and two years of A Level or further education classes) and you’re already at 280 pupils. That’s about one and a half children in your school who could be homeless if we tie it back to the official government stats. That’s someone who was walking the same corridors as you, perhaps even in your class. And you might not have even known it. Experiencing homelessness as a child can have a seriously negative impact on your health and development. Article 27 of the UN Convention on the Rights of the Child, which the UK has signed and ratified, recognises “the right of every child to a standard of living adequate for the child’s physical, mental, spiritual, moral and social development,” and adequate housing is clearly fundamental to realising this right. According to 2017 figures from the Local Government Association, the number of children in temporary accommodation has soared by more than a third in the past three years. This means there are now more than 120,000 children and their families in England living in temporary housing. The law says that temporary housing should be suitable, however, as our first-hand testimonies show, this isn’t always the case. Homeless families should also not be kept in B&Bs for longer than six weeks, but from January to March 2017, 1,290 homeless families spent more than six weeks in such accommodation due to housing shortages. Furthermore, 74% of homeless families stay in temporary accommodation for more than a year. 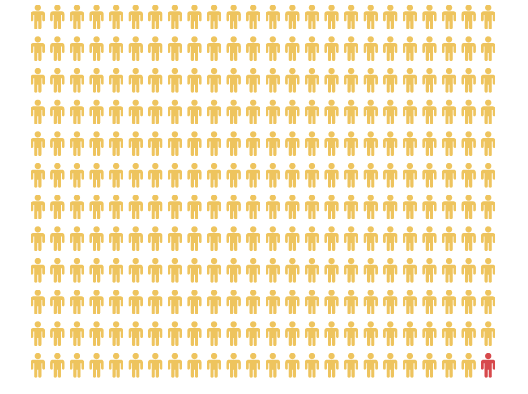 Perhaps the most visible sign of homelessness though is rough sleepers, and the figures don’t look good here either. 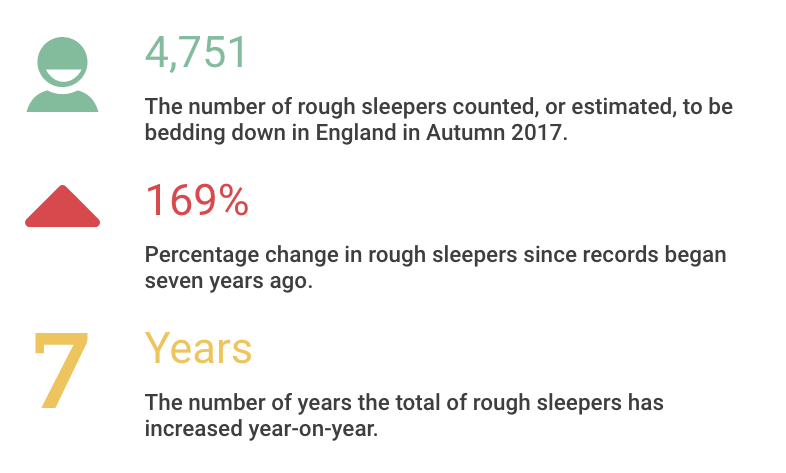 Official figures estimate there are now 4,751 people sleeping rough in England on any given night – this figure has more than doubled in the past five years. 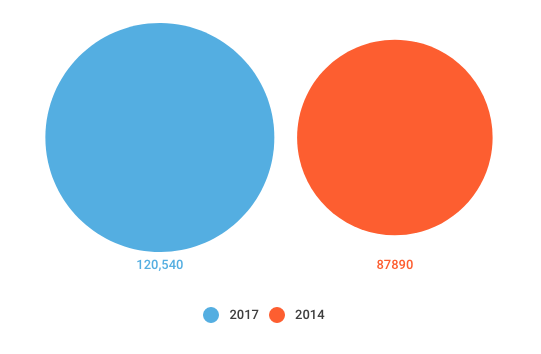 There’s also been a consistent year-on-year increase for the past seven years – when the current methodology was introduced. While most rough sleepers are found in London (closely followed by the South East, with more areas averaging more than 1,000 people on any given night), the most dramatic increase has been in the North West of England. Here rough sleeping has shot up by 39 percent. Homelessness isn’t the only serious issue regarding Britain’s housing; rogue landlords continue to make their tenants’ lives a misery. Research by housing charity Shelter found that more than a million people across the UK have suffered due to their landlord’s illegal behaviour. Looking at behaviour ranging from cutting off utilities to harassment or unsafe properties, Shelter estimates that one in eight renters has been a victim. Many tenants are too scared to speak out in case their landlord retaliates with a revenge eviction, refuses to give them a reference, refuses to return their deposit, or abuses their power in other ways. It’s clear that for thousands of people here in the UK a permanent, and safe, home is far from a reality. Human rights can provide vital safeguards, but as the figures starkly show, much more work needs to be done to fix these issues and ensure that everyone can realise their full set of rights.